In 2009 the Carmichael Chamber of Commerce had just over 100 active members, attendance at events and networking luncheons was dismal and it was operating in the red. In a last-ditch effort to keep the organization open, member Linda Melody was appointed to replace the outgoing executive director. As the chamber approaches the celebration of its 70th anniversary, active membership has more than doubled since Melody’s arrival, participation is robust. Under Melody’s direction, the chamber also was instrumental in establishment of the Fair Oaks Avenue PBID, now called the Carmichael Improvement District or CID, which is looked to as a model by neighboring communities considering a PBID of their own. Below, Melody discusses her strategy for reinvigorating the chamber and where it’s headed next. Q: How did you land your position and what was the chamber’s status at the time? Q: How many members were on the roster upon your arrival? A: We had roughly 342 members on our roster, however, when I started calling and introducing myself as the new executive director, a good number of them laughed on the phone and told me they hadn’t been a member for two or three years. No one was updating the roster. When I culled the list down to active members, it was about 113. Attendance at our monthly luncheons, which were not being held consistently, averaged about 12. It was really bad. They weren’t engaged. Then, it was announced that, by the end of that year, if we didn’t raise $4,000, we would have to close the doors. I was shocked. It was a really difficult time. 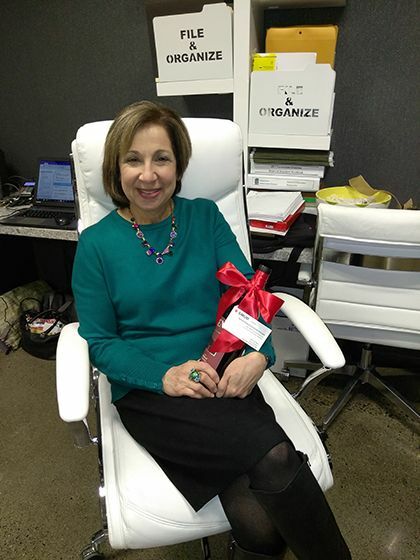 Q: What was your strategy for keeping the Chamber’s doors open and its resurgence? Q: What new events and programs have you implemented? A: There was already an installation dinner on the calendar, but I realized that no one really cared about it. It was not a major event. So in 2010 I launched the Person of the Year Awards and we folded it into the installation event. That first year we honored then Sacramento County Sheriff John McGinness and we made it a fundraiser. That event is now going to be in its ninth year. It has really grown to include a full plate of honorees, including Nonprofit of the Year, to which we donate a portion of the event’s proceeds. We also launched the member orientation breakfast, which is held each quarter. This event is important because it’s our way of providing those touch points that you need bring members into the fold and keep them active. It isn’t just about the ribbon cutting. We also brought in 24 chamber sponsors, as well as some terrific and very supportive event sponsors. We added quarterly power lunches, and also now partner with neighboring chambers for our multi-chamber mixer, which provides wonderful exposure for our members and an opportunity to meet with other chamber members from surrounding communities. Q: What is your current membership? A: We have 272 active members and I know every one of them. I have contact with them throughout the year. Our volunteers call every member to find out if they are coming to the luncheons and events. It’s all about that personal touch. Our monthly luncheons now have 100-plus in attendance and we have had dignitaries and officials from all over come and speak. They are truly well attended and vibrant events now. Q: Your chamber was instrumental in getting voters to approve the PBID. Why push for that? A: That’s right. We are the first chamber to ever orchestrate the beginning of a PBID and we have a seat on the board of the PBID. We worked very hard and we were just rejoicing when we got the votes we needed. We went out and we talked to people and said ‘Look, we are not an incorporated city and don’t have the tax base to address the issues of concern on our own. We pushed to help businesses understand that the PBID would give them a voice and bring in revenue to strengthen their businesses. Now, we have onsite security and street clean up in place, which is making a huge dent in the problems with blight and crime along the boulevard. We also have hired our administrator to oversee the distribution of funds and operations management. I know it was the right thing to do and now we are seeing the positive results from it. Q: What’s on tap for 2018? A: Beginning in January we will be expanding our board of directors from 11 to 14. We just had our elections and all were approved and will be sworn in on Dec. 19. We are moving our multi-chamber mixer to the fall because everyone’s calendar is so full in June. As far as programs go, we are going to be putting a lot of emphasis on education for our members next year. We want to bring in more speakers to our events who can talk about those issues that members want help with or need to learn more about to grow. Of course on January 9, we celebrate our platinum anniversary. The chamber will turn 70 and I’m excited to say I’ve scheduled our first speaker, Barry Broome who serves as the first President and CEO of the Greater Sacramento Economic Council. Economic development issues are very important here. When I arrived, we had a 23% vacancy rate. It is currently under 10 %. Of course we want to see that number go to zero, but we are definitely moving in that direction. Q: What is your message to those considering a membership? 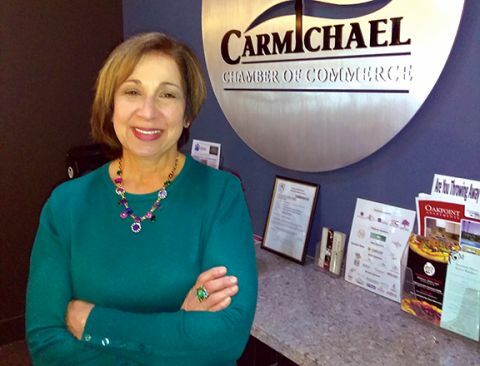 A: My message is that the Carmichael Chamber is a very exciting, energized and growing chamber. In 2016 and 2017 we were identified as the second-fastest growing chamber in the region. Being in an unincorporated area when people feel there is no one there to help them grow their business, we can fill that gap with education, assistance and networking and promotion. I don’t’ know anywhere else where you can go for all of that for $125 a year.